Below is the article that published in the Business Record on March 14. Fun Fact: After finishing his undergraduate degree at the University of Iowa, Chris lived in New Zealand for a year while his now wife, Abbie Sawyer, attended graduate school there. What are your goals in your role at your company? My goal is to continue to broaden Capital Chiropractic & Rehabilitation Center’s multidisciplinary offerings, including the addition of a primary care physician (M.D. or D.O.) and a physical therapist, as well as expansion of our corporate wellness solutions. What are your goals for community involvement? 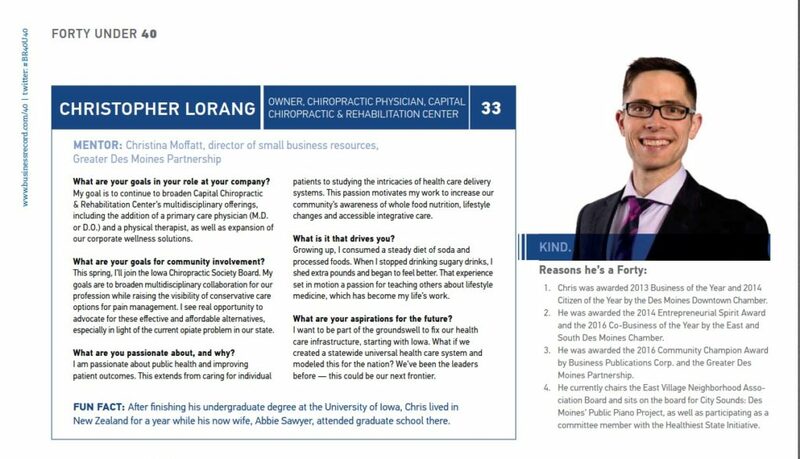 This spring, I’ll join the Iowa Chiropractic Society Board. My goals are to broaden multidisciplinary collaboration for our profession while raising the visibility of conservative care options for pain management. I see real opportunity to advocate for these effective and affordable alternatives, especially in light of the current opiate problem in our state. I am passionate about public health and improving patient outcomes. This extends from caring for individual patients to studying the intricacies of health care delivery systems. This passion motivates my work to increase our community’s awareness of whole food nutrition, lifestyle changes and accessible integrative care. Growing up, I consumed a steady diet of soda and processed foods. When I stopped drinking sugary drinks, I shed extra pounds and began to feel better. That experience set in motion a passion for teaching others about lifestyle medicine, which has become my life’s work. I want to be part of the groundswell to fix our health care infrastructure, starting with Iowa. What if we created a statewide universal health care system and modeled this for the nation? We’ve been the leaders before — this could be our next frontier. 1.) Chris was awarded 2013 Business of the Year and 2014 Citizen of the Year by the Des Moines Downtown Chamber. 2.) He was awarded the 2014 Entrepreneurial Spirit Award and the 2016 Co-Business of the Year by the East and South Des Moines Chamber. 3.) He was awarded the 2016 Community Champion Award by Business Publications Corp. and the Greater Des Moines Partnership. 4.) He currently chairs the East Village Neighborhood Association Board and sits on the board for City Sounds: Des Moines’ Public Piano Project, as well as participating as a committee member with the Healthiest State Initiative.